National Barbie Doll Collectors Convention 2018 dolls: all kinds of new! The National Barbe Doll Collectors Convention took place in Phoenix, Arizona, from July 11th to July 14th. I don’t have any experience in covering this event and usually their convention dolls are not favourites. This year though, things changed. The convention dolls changed. In a major way. And all thanks to Carlyle Nuyera, one of Mattel’s designers. He had the task to design this year’s convention dolls and, imho, did an amazing job. Let’s read what he has to say about them. “Presenting ‘On The Avenue’ Barbie, the 2018 National Barbie Doll Collectors Convention Doll! A few firsts for a Convention Doll; the first Curvy Convention Doll, the first Fashion gift set convention doll and the first convention doll designed by me! When I was designing the convention doll and knew that the theme was ‘On The Avenue’, my mind went to the Fashion Avenue line from the 90s, what I played with as a kid. I wanted to design a doll that allowed for one of Barbie’s earliest and purest play patterns; fashion play! Dressing your Barbie, mixing & matching pieces, styling her to create a lewk. On The Avenue Barbie comes with silver earrings, a pastel organza top that ties in the front with long tails, a shimmering champagne organza ball gown skirt with architectural draping, a black sparkly knit bodysuit (perfect for #Beyoncé #SingleLadies lewks 👯‍♀️), a knee length skirt with layers of silver foiled pewter mesh and silver lamé, a pair of black t-strap heels and a pair of cream strappy heels! I read a lot of positive comments about the dolls on social media, both from attendees and from non-attendees alike. The most amazing ones were from people that recognised themselves in the dolls, people with normal bodies, people of colour, ordinary people. On the other hand, lots of collectors were disappointed that the dolls were not more high fashion styled, more glamorous looking and more embellished. My take? I love them, and I rarely like Barbie convention dolls. They are very chic and stylish, with both outfits reminding me of Isaac Mishrahi’s early collections, where he was combining full evening skirts with knit sporty tops in an way only US designers can do. 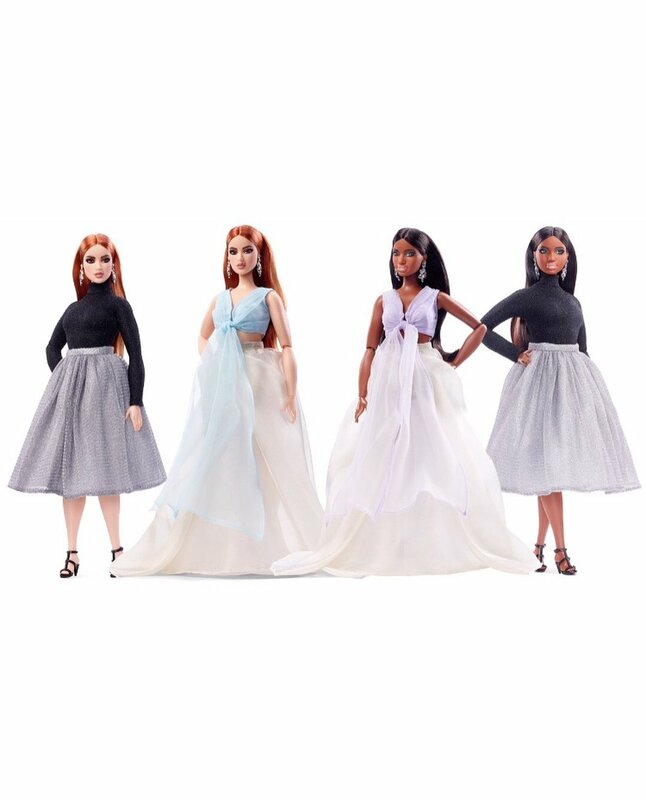 I love that they are not in the usual model muse or Silkstone body, the stiff, frozen, high fashion style body that people are used to receiving in Barbie conventions. But taking a look in most worldwide Barbie conventions, I like these two best. By far. Great job Carlyle and well done Mattel. Please give us more like these. All Barbie photos courtesy of Mattel and Carlyle Nuyera.